OpenSegment is a simple to use 7-segment display. It has the ability to communicate over serial, I2C, SPI, as well as analog and counter modes. It is super easy to use if you just need to display a number but have a lot of features including setting brightness levels and individual segment control built in. OpenSegment displaying the number of speed bag hits. The OpenSegment is the big brother to the Serial7Segment by Jim Lindblom. Both products use the same firmware but have different hardware layouts. Therefor, you can rely heavily on Jim’s datasheet for Serial7Segment and all the example code located here. SparkFun boxes make great enclosures! 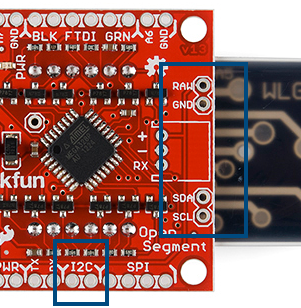 OpenSegment can be powered from 4V (less bright) to 12V, but we recommend 5 to 6V. The default communication is 9600bps over serial. Note: At any time the device can be reset to factory defaults (9600bps) by tying the RX pin to GND and powering up the device. See the Factory Reset section for more information. The onboard regulator will regulate down to 5V. The regulator will protect against shorts, reverse power, over current, and overheating. Powering the board with more than 7V is ok, but the regulator will begin to dissipate the extra power by heating up and--depending on the brightness setting and input voltage--may cause the board to flicker. The OpenSegment has an ATmega328 running a modified Optiboot bootloader. It’s basically a little Arduino running at 8MHz. 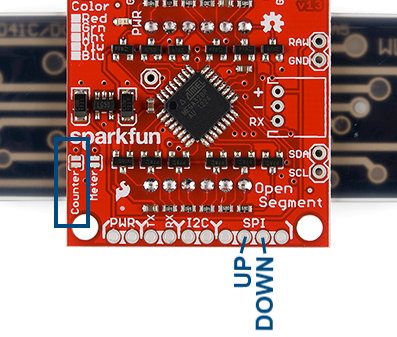 You can reprogram the board using a standard serial connection. We always have an FTDI basic handy to make code changes, but you shouldn’t ever have to reprogram the display unless you really want to tweak the code. The easiest way to control OpenSegment is over serial. 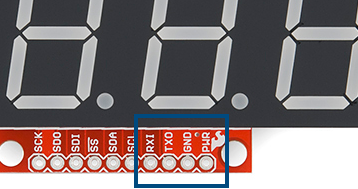 You need only 3 pins: PWR, GND and RX. 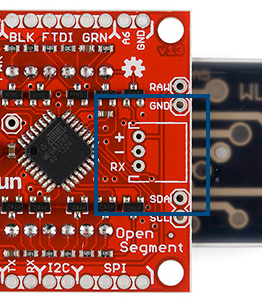 The RX pin on OpenSegment should be connected to the TX pin of your microcontroller. The easiest way to physically connect to OpenSegment is through a 3-pin JST connector. 3-pin JST connector soldered in and ready to go! Solder the JST onto the backpack, plug the JST cable in, and then plug the red wire to 5V to 7V, black wire to GND, and yellow wire to the TX pin of your development board. Using an OpenSegment display with Arduino is very straightforward. Power the display from the 5V pin, GND, and connect the RX pin of the display to pin 8 on the Arduino. Here is an example to get you started immediately. Serial7Segment is an open source seven segment display. This is example code that shows how to display basic numbers on the display. //Note: This method works well as long as your number is less than or equal to 4 digits. 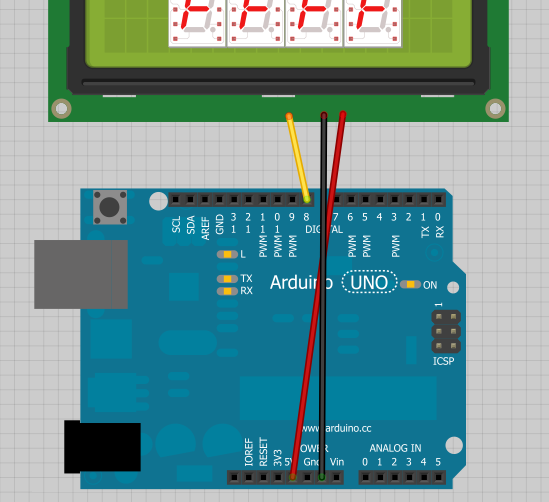 Load the above example code onto your Arduino, and watch the display count up! If you need to control lots of displays at the same time, OpenSegment has the ability to communicate over I2C and SPI. I2C communication requires 4 pins: SDA, SCL, PWR, and GND. The I2C pins are labeled on the edge of the backpack and on the sides to make it easier to chain many displays together. The default 7-bit I2C address is 113 in base10 or 0x71 in HEX or 01110001 in binary. Wire.begin(); //Join the bus as master. Checkout the I2C examples on GitHub for good code to start from. SPI communication requires 6 pins: SDO, SDI, SCK, CS, PWR, and GND. We may add a feature in the future, but for now OpenSegment does not pass data out of the SDO (serial data out) pin and can be left disconnected. 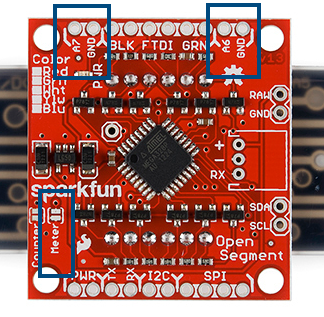 If you’re hooking multiple OpenSegments together on the same SPI bus, the CS pin on each display must be connected to a different GPIO on your microcontroller. We’ve covered the basic data mode; let’s cover the other two modes. An example of how to do this over serial is available here. You do not need to solder the jumper to control the mode. Please read the solder jumper section below for more information. The counter jumper and the two pins that control the count. When the display is in Counter mode, the display will increase by one every time the SDI pin (i is for increase!) is pulled low and will decrease by one every time the SDO pin is pulled low. 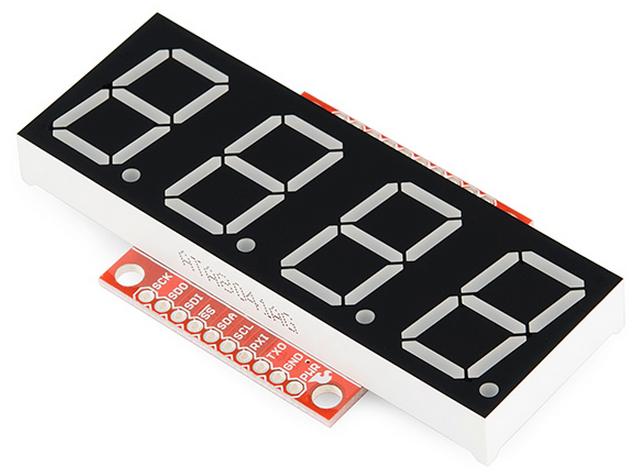 This mode was created to monitor and count the number of times a button is pressed or a reed switch is closed. The display must be power cycled to reset the count. 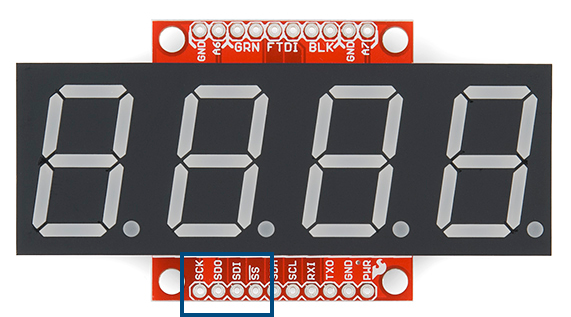 When the display is in Analog mode the instantaneous analog voltage on pins A7 and A6 will be shown on the display with 1/10th volt resolution (0.0V to 5.0V). The voltage on A6 is displayed on the left and A7 is displayed on the right. This mode was created to monitor basic voltages (0 to 5V) without the need of a multimeter. You can use OpenSegment as a counter and as an analog meter without any software configuration. 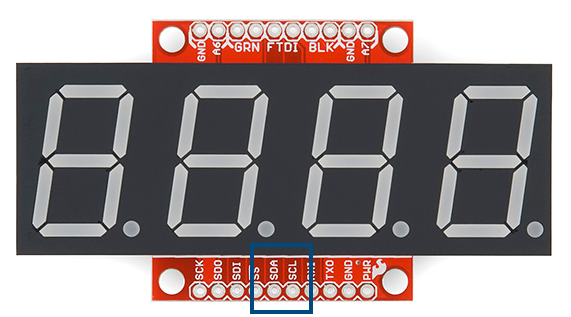 By closing a solder jumper on the back of the display OpenSegment will enter one of two modes: Counter or Analog Meter mode. 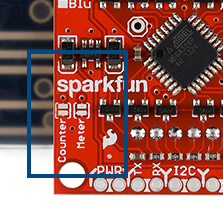 Closing a solder jumper will override any software settings and will force the display into that mode after power up. If both jumpers are closed the display will startup in Counter mode. Have you forgotten what baud rate the device has been configured to? Don’t worry! The device can be reset to factory defaults by tying the RX pin to GND and then powering up the device. Once powered up you will see alternating - (dashes) and _ (underscores) for 1 second. Once you see a rotating display of 0-00 you will know the device has been reset to 9600bps. You can now release the RX pin from ground, and the display will continue to function normally. There is also an example sketch to show you how to do a reset over serial. This can be handy if the display is installed in an application and you can’t pull the RX line low during power up. You should now be able to control the OpenSegment with serial and a few other methods. Be sure to checkout the example code and datasheet for more information. Learn how to use GitHub and help us make OpenSegment better by requesting and adding new features! 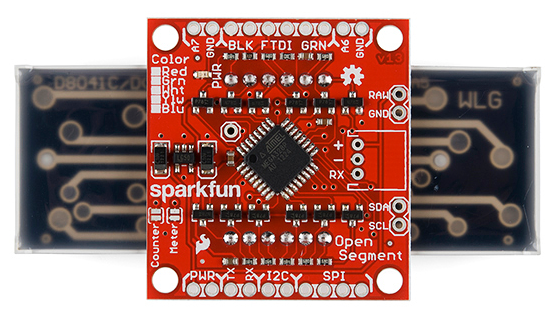 Build your own Reaction Timer, complete with OpenSegment display.